Real-time marketing analytics provides insights into campaigns focused on engaging target audiences on timely topics and events while they are actually happening. These real-time marketing opportunities, enabled by the development of social media and other instant communication technology, can be leveraged by brands as a way to get an edge on their competitors. But what exactly is the best way to approach marketing in real-time such that you can measure the success of your campaigns and prove ROI? Here, we’ll look at how to measure these campaigns in order to show ROI, using real-time marketing examples from top companies. 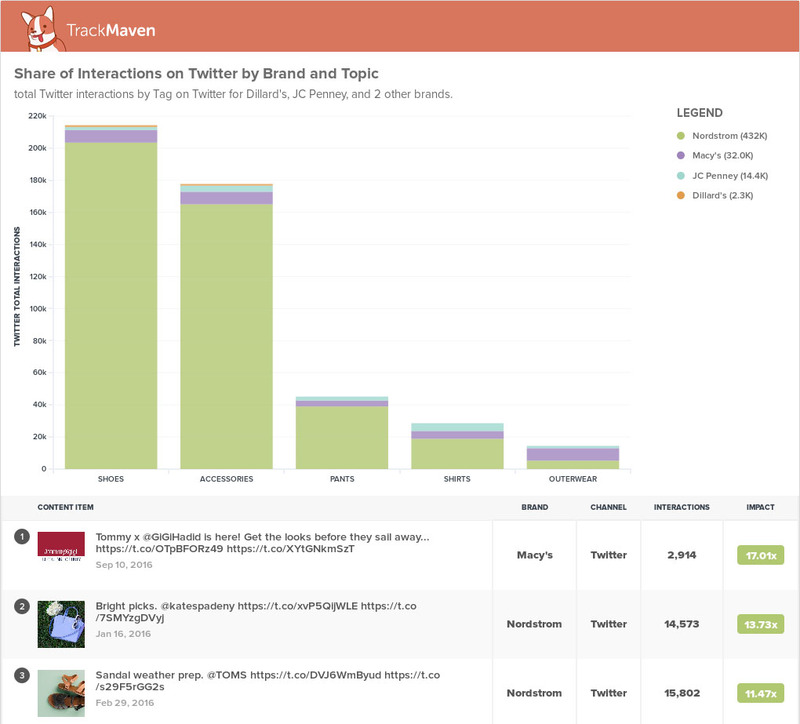 What is real-time marketing analytics? Real-time marketing is a beacon that guides a marketing strategy. It starts with a strategic decision to adapt and refine your content selectively around conversations or events that you can enhance or expand to benefit your brand or your marketing efforts. It’s a nimble approach that’s not just riding a trending news topic, but rather, authentically participating in a conversation or moment that’s relevant to your brand. The best real-time marketing campaigns elevate the conversation while attracting new audiences and demonstrating your expertise in a relevant topic. The best examples of real-time marketing can be found in social media marketing strategies that anticipate and respond to viral topics in a company’s industry. Social media is the real fuel behind the huge boom in real-time marketing. Companies are able to join and contribute to real-time conversations about their company, products, and related issues. For example, during the 2013 Super Bowl, Oreo sent a tweet that proved the power of real-time messaging on social and became a shining moment in the history of content marketing. 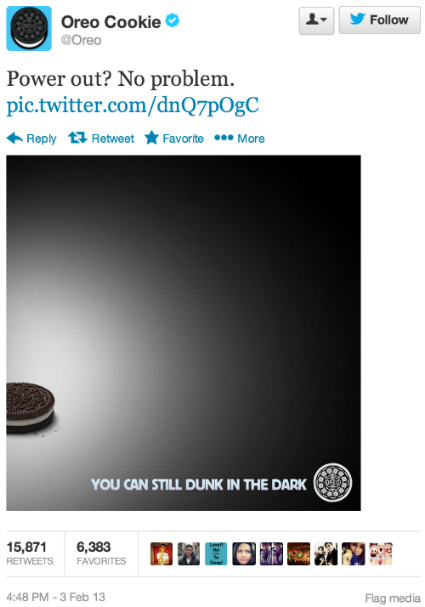 The “dunk in the dark” tweet received over 15,000 retweets and 6,000 favorites, and is a famous example of how a brand was able to capitalize on an event in real time and use it in their marketing strategy. The benefit of contributing to real-time conversations in your space is that it will be about subject matter that fits your expertise and further defines your brand for consumers. Real-time marketing is all about owning relevant conversations and gaining consumer attention by producing content on timely events and topics as they unfold. In order to do this effectively, you have to have up-to-date data insights to get the most out of your real-time marketing analytics. And not just for your brand, but for your competitors as well, so you can adjust your campaign strategy and content to find engagement opportunities your competitors may have missed. Once your analytics data is set up, you can identify the real-time marketing analytics KPIs you’ll use to find out how well your campaigns are performing and to prove ROI. You’ll want to focus on metrics that measure the success of different marketing activities around a real-time initiative, including content, social media, and web performance. Here are the key metrics you should focus when evaluating real-time marketing analytics. As I explained earlier, social media is a center for opportunities to engage with consumers in live virtual conversations. The real-time nature of platforms like Twitter and Facebook allows brands to contribute to relevant topics as real-world events unfold and gain public attention. 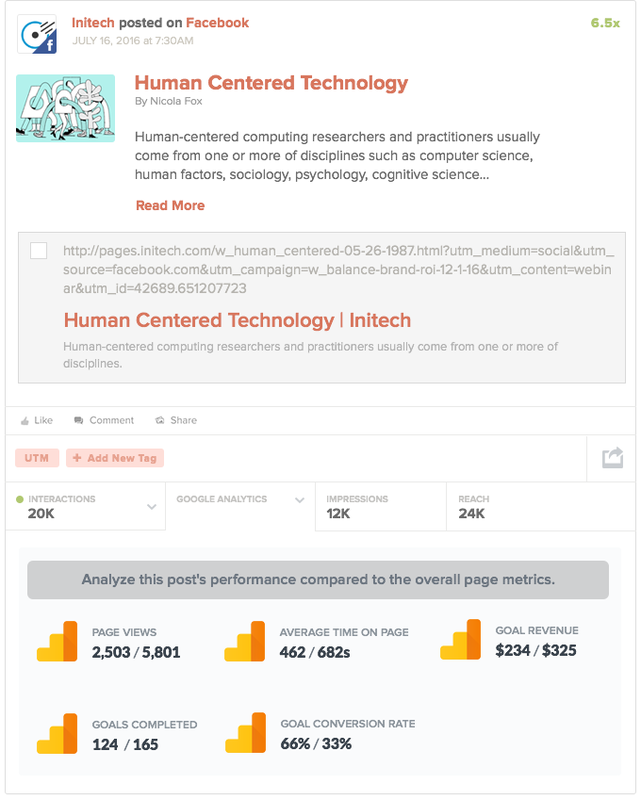 Here are some key metrics you can track to measure your social performance. Real-time marketing analytics can help you evaluate how well your brand is owning the attention of consumers compared to your competitors by tracking share of voice (SOV). SOV is measured by using a share of interactions (SOI) graph, also known as an area chart, to visualize the number of interactions your brand receives on a marketing channel versus your competitors. 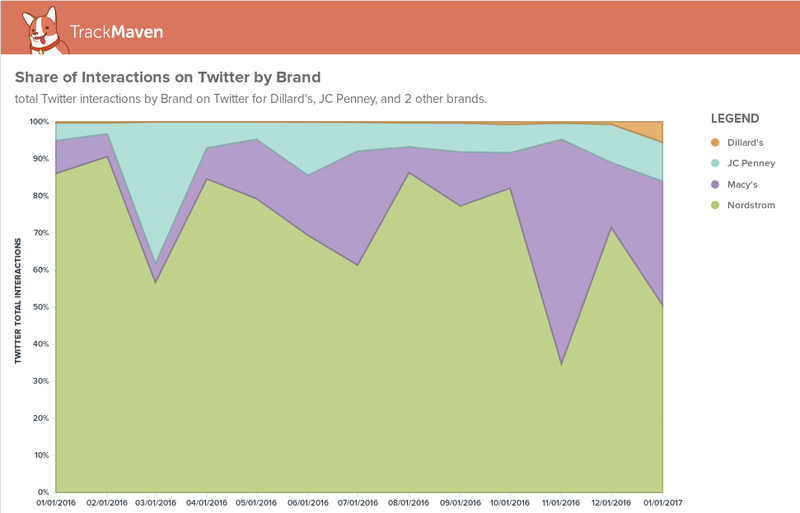 In this example of retail department stores, we can see that Nordstrom has dominated the conversation on Twitter, compared to Macy’s, JCPenney, and Dillard’s. You can take your analysis of your brand’s share of voice a step further and examine which topics your brand owns on specific channels. This is a key part of real-time marketing analytics, especially when you are measuring your performance around a particular topic or event. In this example, using the same retail department stores, we can see that while Nordstrom continues to dominate conversations about shoes, shirts, pants, and accessories, Macy’s owns the most interactions for content about outerwear. Find out what content your competitors are putting money behind on Facebook by using a tool like TrackMaven’s paid content detection. This way, you can better evaluate how your paid and organic content perform compared to your competitors’ paid and organic content. Content marketing can be about creating evergreen content, but one of the best ways to create viral content is to blog about significant industry events related to your brand as they are unfolding. Here are key metrics you should examine from real-time marketing analytics, to help you optimize and improve your content and blog strategy. It can take time for consumers to convert on your blog, but you can use leading metrics to find out how well a blog post is performing. The number of shares and interactions your blog post receives on a topic, compared to your competitors, is a good indicator of it’s impact. 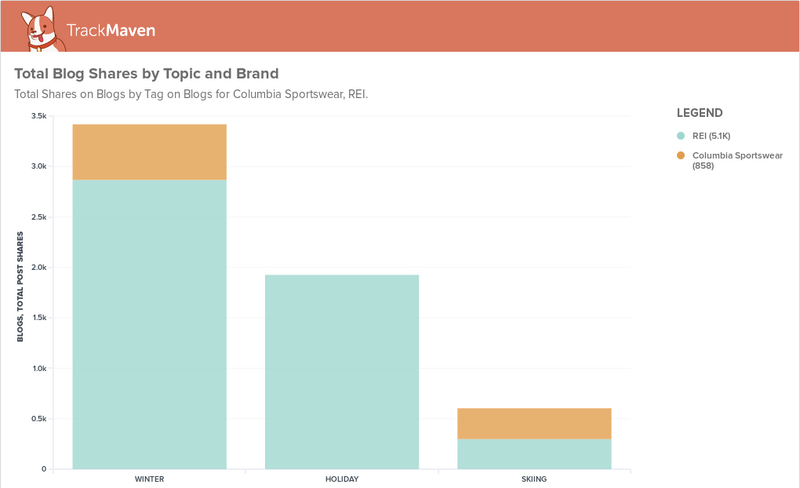 For example, in this graph from TrackMaven’s reporting tool, I’ve set up a head-to-head comparison of REI and Columbia Sportswear to find out who owns which timely winter topics. You can see that REI has a clear ownership of blog shares on the topics around winter, the holidays, and skiing. Often, reporting real-time marketing analytics and the performance of your campaigns means looking at the end result after the campaign is complete. How many conversions can be attributed to your real-time campaigns? Real-time web analytics, however, can track these these conversions — and in TrackMaven, you can track any goal you set in Google Analytics — as they come in, and adjust your strategy accordingly. Track the number of conversions, page interactions, or any other goal you set for your website in Google Analytics. Measure how well your content is driving results and attribute content marketing touches to sales and business revenue. 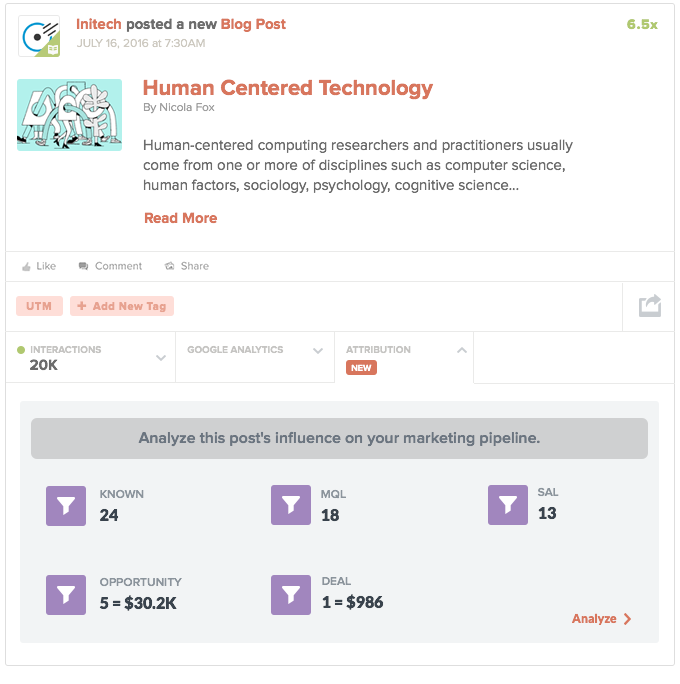 In this example from sample company Initech, this blog post’s full funnel metrics and attribution. Just as with blog posts, it’s important to track how the ROI of every social post your team produces. Monitor the number of conversions your social content helps to drive. In this example from the same company, you can see how many conversions this post assisted, along with dollar value, through TrackMaven’s Google Analytics integration. Brands need to look for the “real” moments happening now that engage their audiences on relevant, timely events. You can prove your brand is at the leading edge of trending topics using the right metrics in real-time marketing analytics.